Update: The duo have shared the album’s tracklsit and cover art. Classics includes standards like “Oh No, Not My Baby”, “Unchained Melody”, “We’ll Meet Again”, and “It’s Always You”, among others. Zooey Deschanel and M. Ward (tka She & Him) have shared the release date for their latest album, Classics. The 13-track collection of “carefully-selected, timeless standards” is due out December 2nd via Columbia Records. It’s the duo’s first album for the major label; their previous four albums, most recently last year’s Volume 3, came out via Merge Records. To accompany today’s announcement, She & Him have shared their cover of Dusty Springfield‘s classic single “Stay Awhile”. Here, Deschanel and Ward have totally re-imagined the love-sick ballad. What was once a more upbeat, slightly rock-inspired number has been re-imagined as a mournful country tune, complete with dusty orchestration and some especially heartbroken wailing from Deschanel. Still, sorrowful and contemplative is sort of this duo’s wheelhouse, and their penchant for pristine pain is amped to the Nth degree thanks to the orchestra. 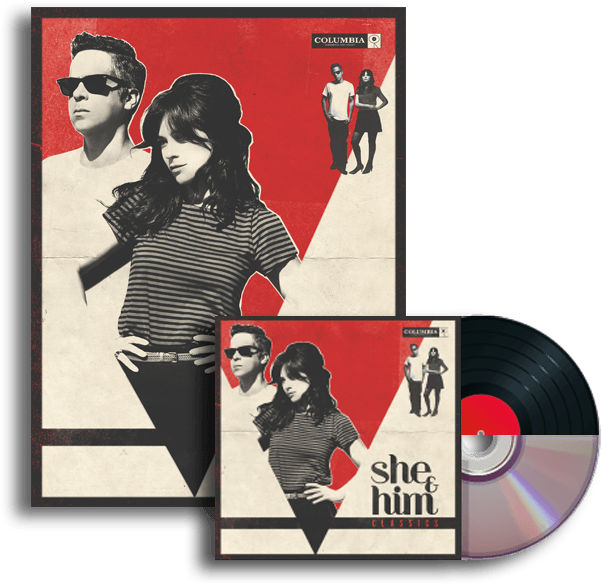 The song is available at She & Him’s official website; just tune the radio widget to 1201 AM to hear it. Or listen in below.